My first visit to Mr. Cumpiano's Shop was a real eye opener. He evaluated my 6th guitar, generously spending two hours of his time to show me things that had taken him a career to learn. It was decided during this visit that I would build my next guitar with his guidance. I have decided to devote a few pages to this special guitar project. 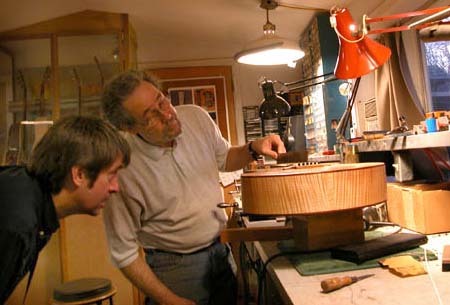 I have been fortunate to have an opportunity to build a guitar under the tutelage of William Cumpiano. The goal was to learn more about the mysteries of guitar building so I could design and create an instrument that has less flaws in order to play and create my music. Although I have made some playable guitars, the chance to learn how to build a more refined instrument was the path for me. Mr. Cumpiano is a very sincere, patient and flexible man, allowing me to visit him in stabs through a 6 month time frame with "home work" sessions in between. The good thing about this method is it has allowed me time to absorb the gobs of great knowledge and information he has given during each session. The down side to this method is that My home sessions are unguided. Although my intent was to perform operations at home that would not be necessary to take up Mr. Cumpianio’s time, I feel that after the fact, I may have missed out on some important guidance. It would seem that this process within itself has created knowledge by the fact that it has forced me to pay more attention to my mistakes so hopefully, they wont happen the next time. Than again, as W. Cumpiano has pointed out to me, "there are no mistakes, only opportunities". A true sign of a good builder is their ability to turn an "oops" into a "there". And one of my favorite life sayings that also applies, "don't sweat the small stuff". The next few pages are an attempt to show some of the "there" moments and a few "ah ha" realizations as well, through the sessions with Mr. William Cumpiano, Master guitar maker and Teacher. This is a sample composition featuring Guitar 7. Instrumental guitar7 mp3.